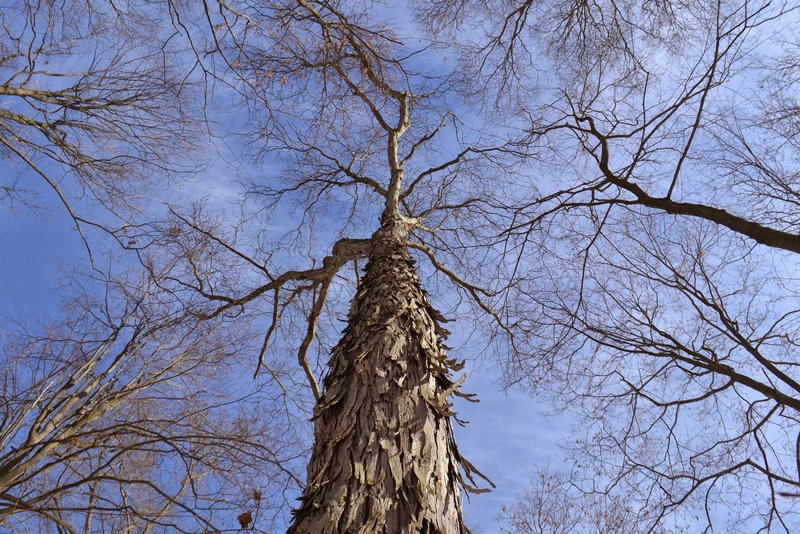 Carya ovata.shagbark hickory.tree.natureinhumanity.blogspot.com (Accessed 12/2016). 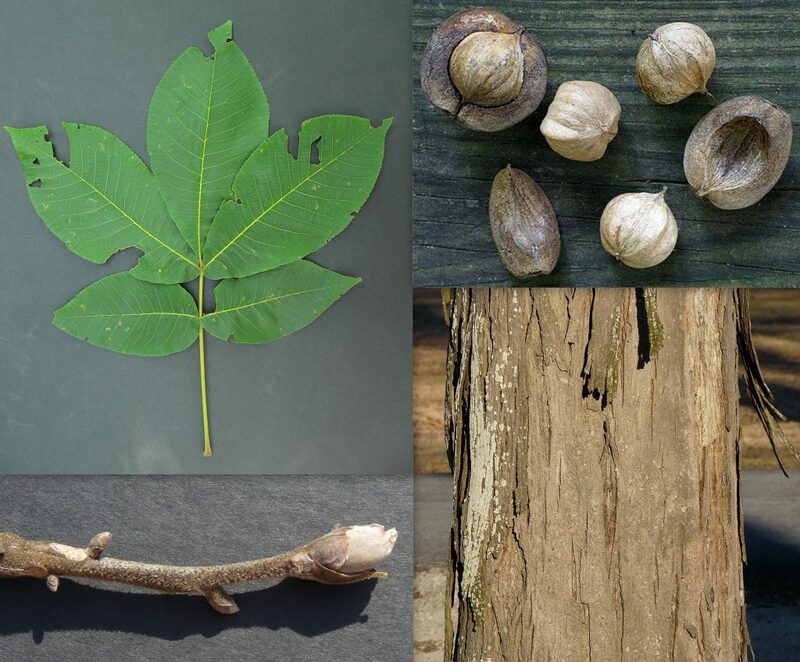 Carya ovata is a tree to 27 m tall, 90 cm dbh, lives about 300 years; bark gray, shaggy, peeling in large plates from top and bottom, twigs stout, dark reddish-brown; terminal winter leaf buds dark, outer scales persisting, large, over 1.3 cm long, usually wider than twig, scales overlapping, not falling early; growth pattern strictly determinate (Marks 1973; Gargiullo, personal observation); deeply taprooted, roots associated with ectomycorrhizal fungi (Decker and Boerner 1997), slow growing. 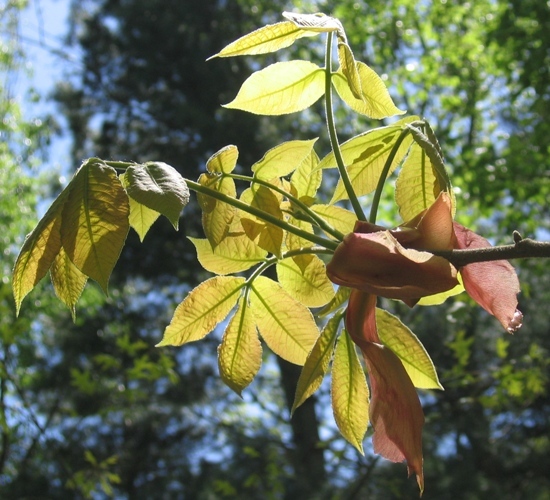 Carya ovata (shagbark hickory) leaf, fruit, buds, bark. Richard & Teresa Ware.Georgia Botanical Society.gabotsoc.org (Accessed 12/2016). Leaves alternate, to 35 cm long, pinnately compound, leaflets usually 5 leaflets, 8-18 cm long (Little 1985) terminal leaflet much larger than lateral ones, widest above middle, young leaflets hairy below, older leaflets hairy on marginal teeth (use lens). 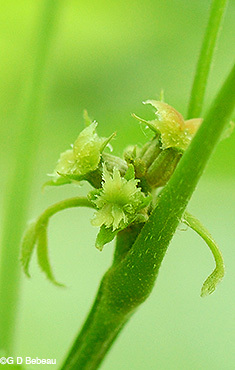 Carya ovata pistillate flowers. © G. D. Babeau. The Friends of the Wild Flower Garden, Inc. Trees and Shrubs of the Eloise Butler Wildflower Garden. friendsofthewildflowergarden.org (Accessed 12/2017). Flowers monoecious, male (staminate) flowers in clusters of dangling catkins, female flowers few together at ends of twigs, wind pollinated, March. Fruit rounded, to 5 cm wide or more, husk to 1.2 cm thick, splits to base, nut 4-angled, sharp-pointed at tip, tannin content 0.48% (Barnett 1977), lipid content ca 30% (Smith and Follmer 1972), kernel sweet, edible, Sept.-Oct.; dispersed gravity and by squirrels and chipmunks. Seeds must overwinter to germinate. Nuts eaten by many mammals and some birds (jays, crows, pheasants). Wetland status: FACU-. 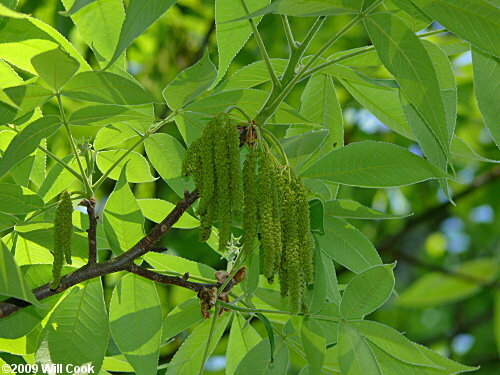 Carya ovata staminate flowers. © 2009 Will Cook. Carolina Nature. carolinanature.com (Accessed 12/2017). 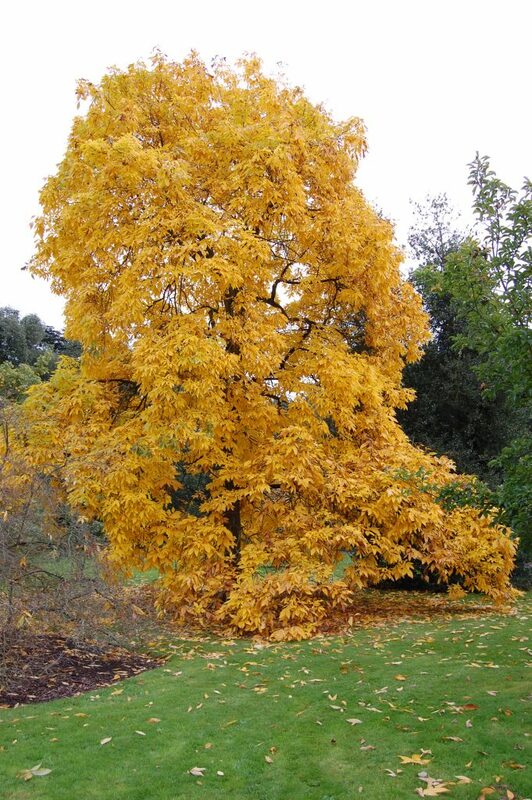 Carya ovata tree in Autumn. © Davis Landscape Architecture, London, UK. www.davisla.com (Accessed 12/2017). Habitat: Upland moist to dry undisturbed forests. Soil pH 6.1-6.5. Young trees stump sprouts if cut or burned. Drought tolerant. Moderately shade tolerant, index 5.4. Saplings persistent in forest understories and do not respond to gap formation with markedly increased growth but must await larger disturbances (Whitney and Runkle 1981; Robison and McCarthy 1999). Intolerant of flooding and salt. Susceptible to fire damage (Burns and Honkala 1990; Sinclair et al. 1987; Hightshoe 1988). Notes: Flowers and bark eaten by a few birds and mammals (Martin, et al., 1951) especially squirrels and deer (personal observation) Diseases and insects same as those of C. cordiformis.